Cheers! 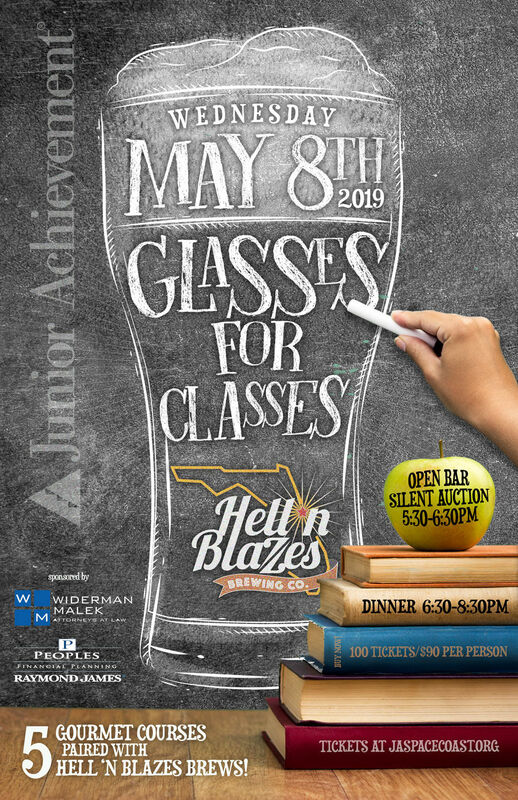 On May 8 we'll be raising our glasses to Junior Achievement at Hell 'N Blazes for a five course gourmet food and beer pairing event. Start the night with an open bar and a little friendly competition as you bid on our silent auction. At 6:30 we'll move into the dining room where each of five gourmet courses will be introduced by Hell n Blazes' Chef Drew Campbell and Brewmaster Todd Furbeck, as they explain the flavor pairings they designed between food and beer especially for this event. Junior Achievement of the Space Coast has recently been designated a five-star JA office, and we're on track to reach almost 12,000 Brevard students this year with programs on financial literacy, entrepreneurship, and workforce readiness. Help us reach this goal by enjoying good food, good beer, and good friends at Hell n Blazes! Junior Achievement Space Coast has partnered with Give Lively to securely process your online donation. This transaction will appear on your credit card statement as "Junior Achievement Space Coast". This transaction is subject to Give Lively's Terms and Privacy.